I am in two minds over Volume. 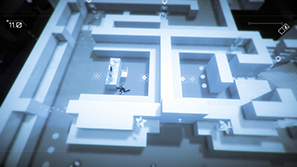 There are some very solid mechanics here making for a great stealth game but missing some of the charm that previous game - Thomas Was Alone – had. The narrative is clunky and under-developed, some of the voice acting is unconvincing but the score is sublime. I came into this game hoping for a strong narrative combined with the stealth action; I leave a little disappointed in that respect, but that doesn't mean Volume isn't a good game. You play as Rob Locksley. Rob has hacked a volume – an AI - into making virtual layouts of buildings in order to demonstrate how to steal the valuables in the most efficient manner. If you ever played Metal Gear Solid's VR Missions you'll be familiar with the routine here. The game is heavily influenced by it but also managed to step out from its shadow and be its own thing. In each level you are required to collect all the crystals and head to the exit. Preventing you from doing so are guards. Guards patrol certain areas and if you are caught in their vision cone you have a short amount of time to become inconspicuous once more. You can hug walls and crouch to avoid eye-sight. The controls are very tight so movement remains precise throughout. If you don't make it in time you are attacked and you restart from the latest checkpoint. There are over one hundred levels in Volume's story mode. As you progress they become increasingly complex but your collection of moves and items grow. You can pick up a bugle: a projectile that will make a sound on your command, causing guards to leave their patrol and investigate, and mute; making your footsteps silent while you can move quicker and an item that makes you temporarily invisible. Items are isolated to individual levels so you always need to collect them in order for use. The great variety here makes it a lot of fun to solve most of the levels. I found Volume to be most enjoyable in its final third. The levels become interestingly complex and it takes a moment to decide on the best approach. 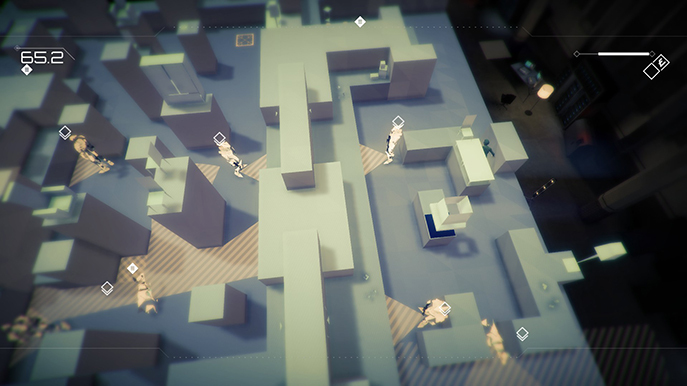 By this time, you'll be very familiar with the game and skilled in outwitting the robotic guards. Up to this point I was becoming somewhat burnt out. There are a great many levels and I think it would have benefited if some were culled in the middle. They began to blend in to one until the more interesting and daring concluding levels. Now: the narrative. In selected levels Locksley will talk with Alan (the volume) and various other characters. These story dumps are interesting and welcome but their implementation is poor and distracting. 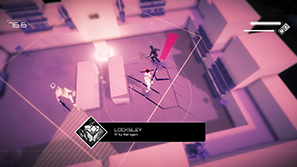 The voice over will begin as you start the level; but interact with anything or even pause the game and the dialogue will start again from the current sentence. This leaves you ultimately have to put the controller down for a couple minutes every few levels and wait for it to finish. It just feels clunky. Most of the voice work is fantastic; Danny Wallace puts in another great performance, as does Andy Serkis. I found Charlie McDonnell's protagonist to be lacklustre, almost as if he's unconvinced by the very things he was saying. A guest appearance playing a blogger was Jim Sterling (whose work I enjoy) sounding like Jim Sterling but with someone else writing Jim Sterling. The vast majority of the narrative is conveyed over the voice work and I found there to be a disconnect with what I'm told is happening and what I'm seeing on screen. The most fascinating part of the narrative for me was how this game ties in to Thomas Was Alone – Volume is set in the same universe and you get snippets of context of the events following the conclusion of that game. Visually, the game looks fantastic. Each level builds itself around you from shards as you start and a strong depth of field keeps you focused on your immediate surroundings. 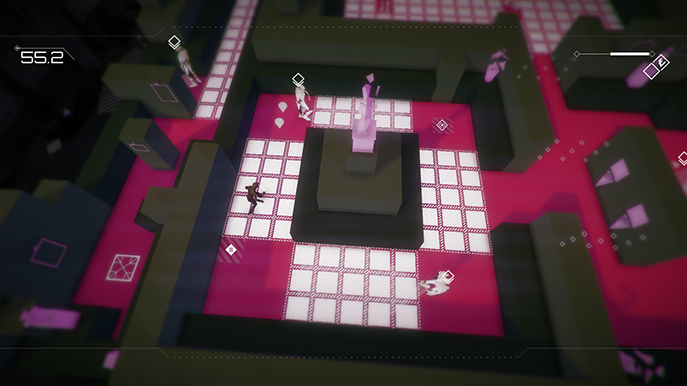 The colours of the blocks contrast well with the floor and enemies. The audio deserves a special mention. David Housden's score holds everything together; strongly conveying the atmosphere of the game. Without initially noticing, the music becomes more severe and remorseful as the game progresses. The instant change in music whenever you are spotted will be guaranteed to make you jump at least a couple of times. Absolutely wonderful. Volume is a buggy game. The aforementioned restarting of narrative is joined by invisible guards freezes in gameplay when you interact with certain things. This happened far too many times for me to shrug it off and it became wildly frustrating. Occasionally, when spotted by guards it will freeze for about a second and can cause instant capture. 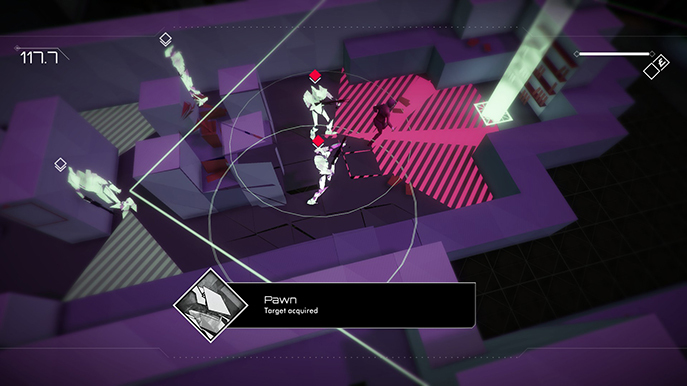 Volume is a great stealth game with an okay narrative. This internet-age recreation of Robin Hood – even the antagonist is named Gisborne – will please stealth fans. The level builder will keep you busy after completing the story mode if you desire to play more. 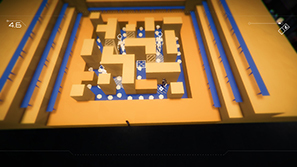 I've not been able to find any user-made levels so far that rival those created by Bithell and his team. If you enjoyed Metal Gear Solid's VR missions you'll get a real kick out of this.